Welcome on CSS color palette generator. CSS color palette generator is a powerfull tool to create the best and the most beautifull color schemes. 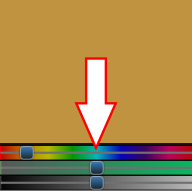 The random buttons right above the dark, light column can help you create awesome color palettes. Hover the cursor on one of the columns to select the correct column you want to change. Use the one-line functions to align the values. From this mode, you can use the control panel in the middle of the page to put your colors together. The control panel only affects the selected column HUE, SATURATION or LIGHT. To fine tune all colors individual, you can use the controllers on the bottom of the page. CSS color palette generator is free to use.